This is a tale that had to be told. Was just floored by the service of Amore Gelato at Bandra. I was craving for ice cream couple of nights back. Last night too. We sat down for dinner. K called Amore. No one picked up. She called up Baskin Robins. No one picked up. Disheartened I sat for dinner. Suddenly the phone rang. It was someone called Yasin from Amore.He was calling back our number. For the record, this was a new number for them so they didn't know that we had called up. We usually call from my phone. Yasin explained that their systems were down and they couldn't deliver. Well, nice of them to call back and tell us that. But he went on. Apparently their head office has asked them to take down the number of those who had called to order but couldn't get ice creams. They were to be given a complimentary gelato when the systems started working. Well, we forgot about it. Anyway who was going to order an ice cream the next day to get a free ice cream? Chapter closed. Tonight K got a call just as she was returning. It was from Amore. Their systems were working. They wanted to know what was the flavour that we wanted. We would get a medium cup on the house to make up for yesterday. Ten minutes later the bell rang. It was Yasin. 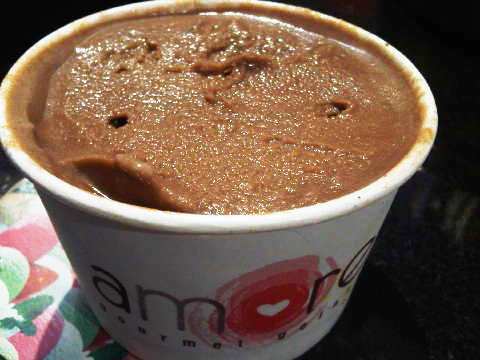 With a large cup of Ferrero Rocher flavoured gelato. awesome! hats off to gelato. Im converted to healthy icecream now! Stumbled in from my blog, Clockwork Proxy. Ferrero Rocher Gelato sounds amazing! Unfortunately, I live in a small town, so there's no Gelato for miles around. On the flip side, living in a small town means that service like this is a norm, mainly because everyone knows each other.